It was a big day in the history of Dollinger Steel of Beaumont, Texas. It was their 50th anniversary dinner and countless guests had been invited to the celebratory dinner. And the photographer had come along as well to record the event. Back in the days when photographs were about more than just an idle click of a mobile phone touch screen, events and photographs went together. Weddings, birthdays, gatherings, anniversaries and parties : none would be complete without the burst of a flash bulb and all those practised cheese-smiles. 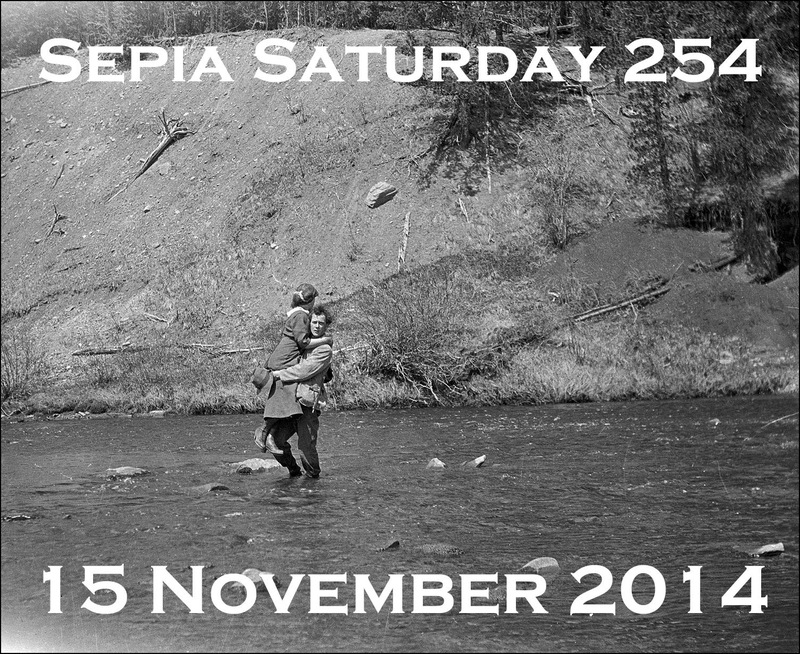 So for Sepia Saturday 252 - post your posts on or around Saturday 1st November 2014 and add a link to the list below - we are asking you to feature an event, a tent, a cooking pot or even a name-tag. Let your freedom of interpretation be as extensive as a hungry diner queue and as voluminous as a generous cooking pot. 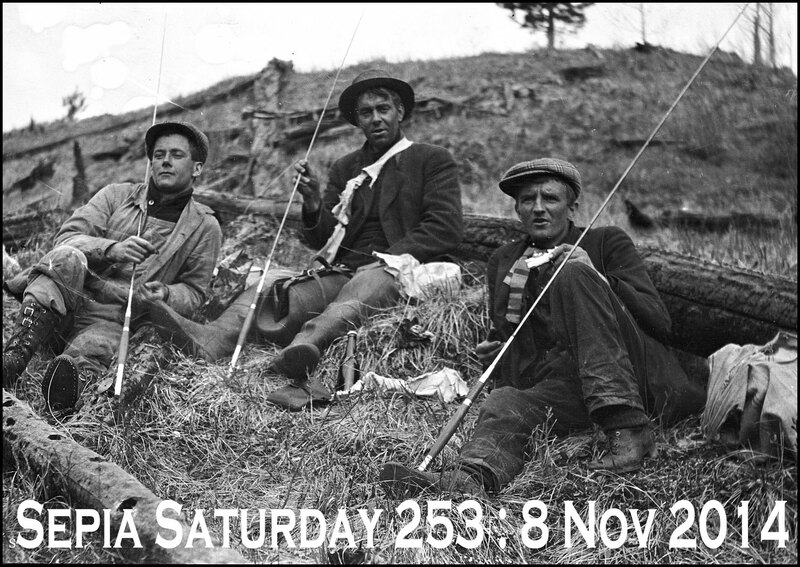 Whilst you are waiting to fill your sepia plate, you might like to contemplate the next two Sepia Saturday calls. It looks like we have a fishy few weeks ahead, so before you get your feet wet, it is time to join the line for a bite to eat. Fish and chips anyone? I'm back. First let me thank Marilyn for looking after the blog, on top of all her work on the Sepia Saturday Facebook Group, whilst I was away. When she chose this splendid image from the Tasmanian Archive and Heritage Centre, she suggested as possible theme interpretations - bobbies, bellies, bums and brushes - but one could keep the alliterative pendulum swinging by adding beards. Whatever your choice of old image - be it a b or be it not - simply post your post on or around Saturday 25th October 2014 and then add a link to the list below. 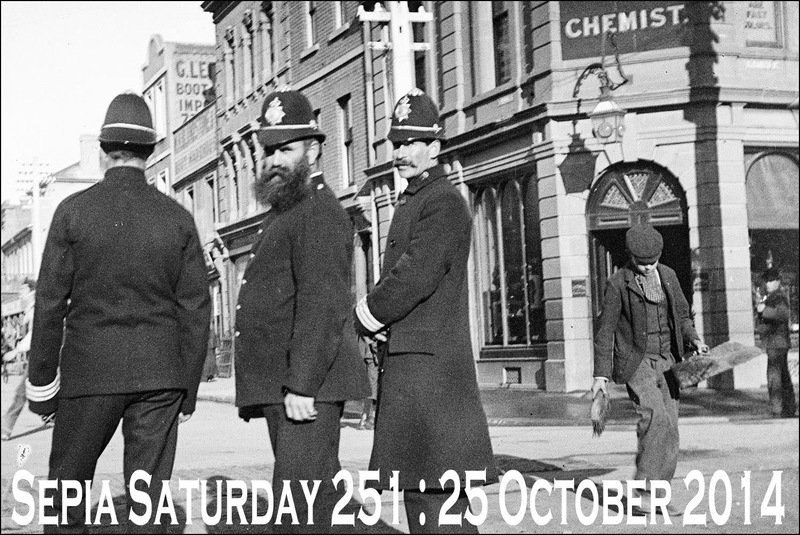 Before you accompany the constables to the Police Station to help them with their enquiries, take a look at the next couple of Sepia Saturday calls. So there we go. It wasn't me that did it. In fact I have an alibi, officer. I was writing my Sepia Saturday 251 post at the time. This week’s prompt picture comes from the Powerhouse Collection via Fickr Commons, titled ‘A Man And His Shoe Repair Stall’ and dated 1930. It’s a hand-painted lantern slide but there is no other information given. You can let your imagination run free with your responses to this one. 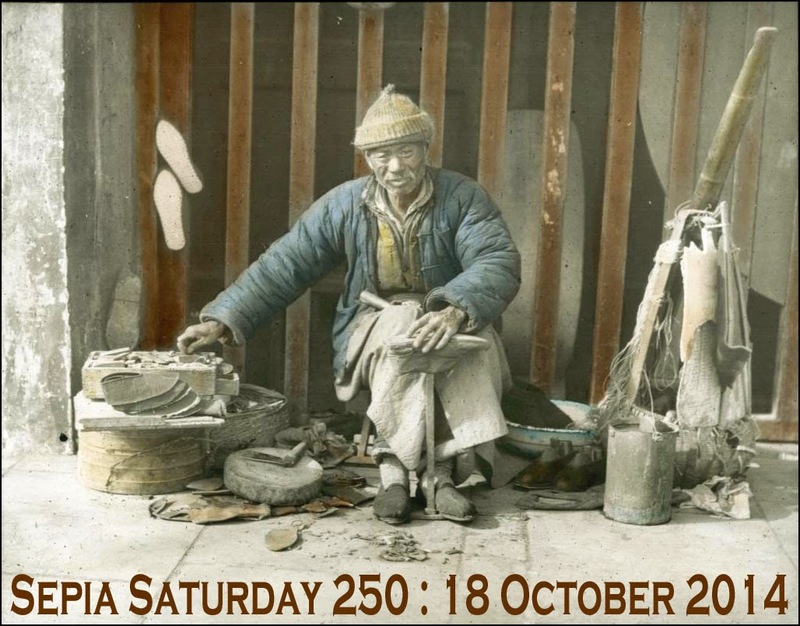 Street traders, roadside artisans, menders, cobblers, tools-of-the-trade, hand-colouring and lantern slides - or you could celebrate Sepia Saturday’s 250th Edition with a party! Of course you don’t have to theme and can simply post an old picture or two with a link back to Sepia Saturday, on or around 18 October. Enter your (direct) link to your own blogpost below and leave us a comment please. Then take a trip to other Sepians to see what wares they have displayed; and remember to show your appreciation of their efforts with a word or two in their comments section. 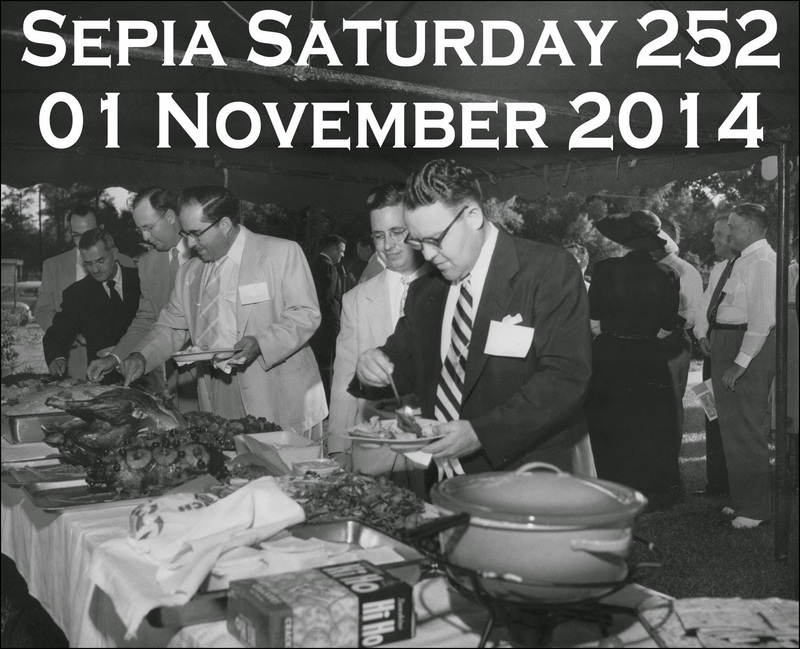 Don’t forget that there is a Facebook group for Sepia Saturday contributors. Why not join us as we have a lot of fun and post some interesting items there. You will need to have posted on Sepia Saturday at least once; then you’ll be given a warm welcome. Here’s a hand-coloured mini-banner to add to your post if you wish. It’s difficult to guess what is going on in the above photograph, but we can have fun trying. The picture comes from the TAHO (Tasmanian Archive and Heritage Office) via Flickr Commons, and is simpled titled ‘Old Coaches 1900’. Alan is still on his travels, though his mode of transport is somewhat different to the one in our prompt picture. I wonder if he is wearing his sunhat, and will a fellow traveller playfully try to knock it off his head? This is mischief being made by idle hands; the coachmen are waiting for their passengers and a little clowning around is going on for the camera. No mischief is expected from our Sepia Saturday participants this week. There are any number of themes that can be taken from this picture: coach rides, old transport, roof-racks, luggage, waiting, animated discussion, clowning, cab drivers, or whatever else pops into your head. Of course you don’t have to theme and can simply post an old picture or two with a link back to Sepia Saturday, on or around 11 October. Enter your (direct) link to your own blogpost below and leave us a comment please. 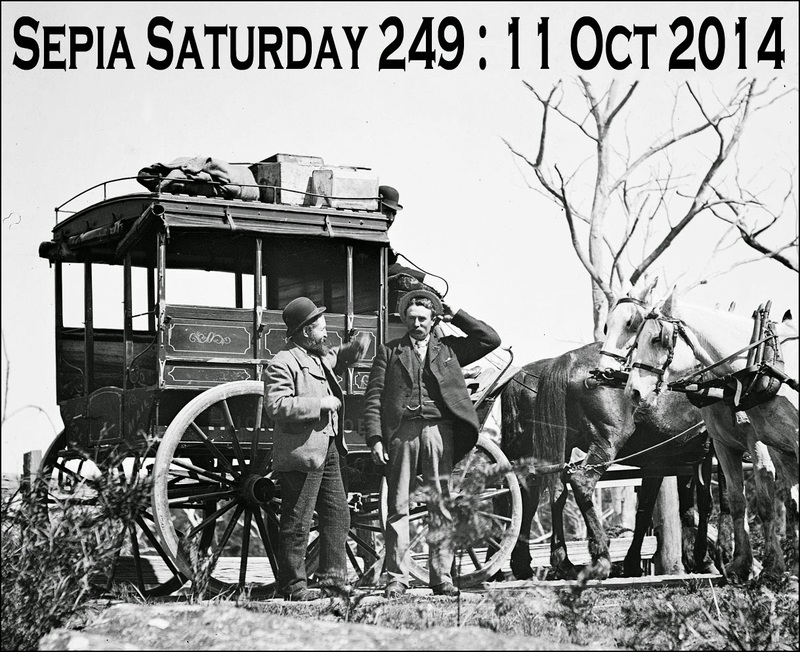 Then hop aboard the Sepia Saturday coach and visit other Sepians to see what they made of the prompt; don’t forget to show your appreciation of their efforts with a word or two in their comments section. Just time to mention that there is a Facebook group for Sepia Saturday contributors. Why not join us as we have a lot of fun and post some interesting items there. You will need to have posted on Sepia Saturday at least once; then you’ll be given a warm welcome. And here’s a mini-banner for this week to add to your post if you wish.